The Mac Wire will be in attendance at tonight’s show which brings today the original members of the Mink DeVille Band (guitarist Louie X. Erlanger, bassist Ruben Siguenza and drummer Tom “Manfred” Allen) along with Mr. DeVille’s latter-day sidekicks and even Richard Lloyd (of Television fame). We can’t wait to see what happens but we think it might be one big reunion of all the great New York “players” from the original CBGB’s scene of the late 70s not to mention a spattering of all of New York’s finest “session players.” Did we fail to mention that former Billy Idol drummer Thommy Price will also be there as well as everyone’s favorite saxman Crispin Cioe (of Uptown Horns fame)? 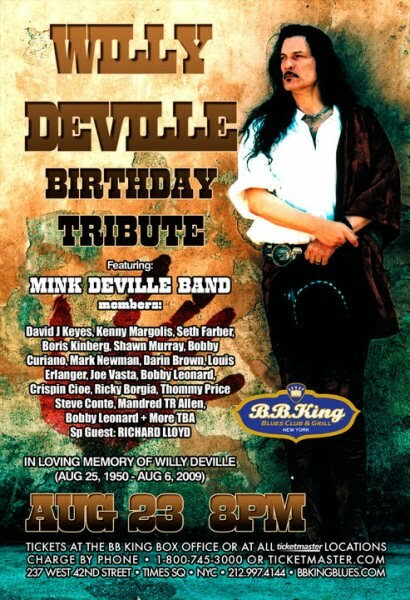 This is going to be one of BB King’s best jam sessions of over 25 top-flight musicians ever but we admit we are going to see the old Mink DeVille back together (sans Willy). May Willy rock in peace…we know he will be looking down at these sessions from above as he chain smokes a full pack of Marlboros (hey, you do not have to look after your health up there like you do down there)! Get Best of Mink Deville Now!